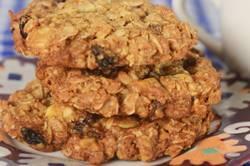 Oatmeal cookies are a favorite with kids and adults. It's hard not to like this sweet tasting cookie with its soft and chewy texture. Besides lots of rolled oats, they contain dried fruit (raisins, dried cherries or cranberries), chocolate chips (white and/or semi sweet), and chopped nuts (walnuts and/or pecans). There is always the question of what type of rolled oats to use in baking; old-fashioned or quick-cooking. Both start with oats that are cleaned, toasted, and hulled to become what we call oat groats. The difference between the two types is in the thickness of the oats. Old-fashioned rolled oats are thicker. This gives the cookies a nice chewy texture which is why I like to use them in this recipe. As a side note; rolled oats were first produced in 1877 by The Quaker Mill Company and are known for their distinctive cardboard canister with its red, white and blue label. By 1884 the Quaker Mill Company began selling their product, calling it "Quaker Oats". Incidentally, Quaker Oats is said to have been not only the first packaged food in America but also the first product to be mass marketed in the United States. And speaking about Oatmeal Cookies. The first oatmeal cookie recipes contained just 1/2 cup of oatmeal. The recipes that we see today, that are loaded with oats, are adaptations of a recipe first developed by The Quaker Oats Company during the Second World War. That recipe also used vegetable shortening, instead of butter, because butter was in short supply. So if you see recipes today calling for shortening you now know where that originated. This recipe is adapted from Jane Rodmell's 'Best Summer Weekends Cookbook'. Her cookbook is an excellent resource for both sweet and savory recipes. Oatmeal Cookies: Preheat your oven to 350 degrees F (180 degrees C) and line two baking sheets with parchment paper. In the bowl of your electric stand mixer, fitted with the paddle attachment (or with a hand mixer), beat the butter until smooth. Add the sugar and beat until creamy and smooth (about 1-2 minutes). Add the egg, honey, and vanilla extract and beat to combine. In a separate bowl, whisk together the flour, baking soda, salt, and ground cinnamon. Add the flour mixture to the creamed mixture and beat until incorporated. Then stir in the rolled oats, nuts, raisins, and chocolate chips. For large cookies, use 1/4 cup (55 grams) of batter (I like to use an ice cream scoop to form the cookies) and space the cookies about 3 inches (7.5 cm) apart on the baking sheet. Then lightly wet your hand and flatten the cookies slightly with your fingers so they are about 1/2 inch (1.25 cm) thick. Bake the cookies for about 12 - 14 minutes or until golden brown around the edges but still soft and look a little wet in the center. Remove from oven and place the baking sheet on a wire rack. Let the cookies cool a few minutes on the baking sheet so they firm up, before transferring them to a wire rack to finish cooling.